The board game market isn’t exactly crying out for another crime-themed game; forget older games of that theme and just look at the last 12-18 months where a number of such games have been released. That’s not to say it’s necessarily a bad thing as a crime-related game can go one of a thousand directions, whether that be the time period it’s set in, locations, types of incidents, as well as many more. Forget the stereotype crime setting of deep, dark London where a young, slightly out of their depth detective has to solve and prevent murder upon murder with the help of some trusty sidekicks. The possibilities are now endless! 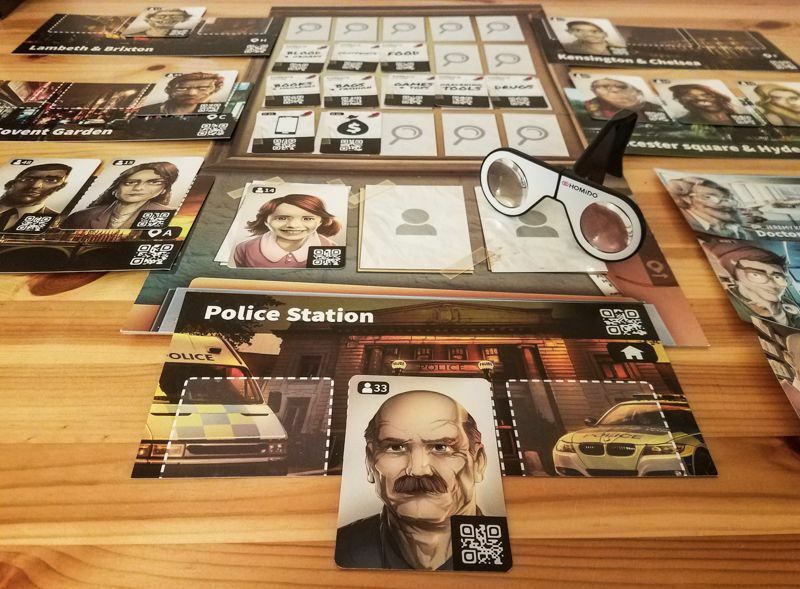 In today’s review, we look at Lucky Duck Games’ Chronicles of Crime: a crime-related board game set in London that puts you in the role of a detective who has to……oh, dear. Just to make it clear from the outset, to play Chronicles, you will be required to download their app on your smartphone or tablet; without the app you can’t play the game as it directly links to the components via QR codes. A quick look at the components, then, before I explain how the game works: Chronicles has very few of them, really; you get character, evidence and special item cards, as well as location boards, some forensic contact boards and a main evidence board, which all other components are either placed on or around. Component quality is okay, the artwork is pretty standard, really, and I would have liked to see artwork on the evidence and special item cards like there are on the character cards. The iconography and graphic design do help with ease of play and speed of the game: It’s straightforward for players to see where certain components need to be placed, and everything is kept in order in a game that could have become slightly messy and confusing. The rule book is very short at just 7 pages, but that is because the app teaches you how to play the game through a tutorial, which in my opinion is a great idea. The components, however, are not where this game sings. Let me tell you how it plays. 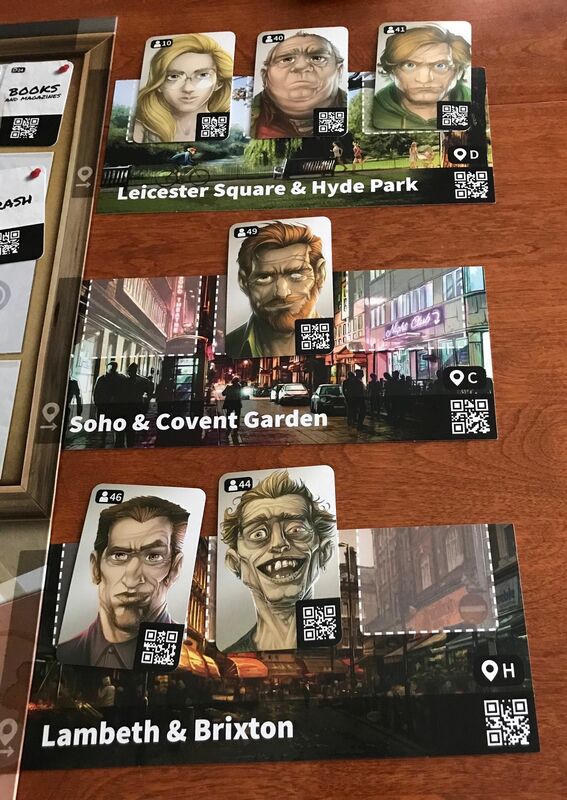 At the start of the game (I will use the tutorial scenario to explain), players who are working together will start at their home location, which is Scotland Yard, where the app will tell you to find character card 33, who for this scenario is the police chief (characters will change with each scenario), and he will proceed in giving you a brief concerning a suspicious death. During the brief he will give you another location. which players will find and put next to the main board; he may also give you the names (character numbers) of the victim, witnesses and suspects, etc. for players to find in the deck and place them at a specific location. Once this is done, then it is up to the players to progress through the game from then on. For example, in the tutorial an elderly woman has been found dead, and your first task will be to visit her address, meaning you take your phone and scan the QR code at that location, which transports you to that location. Once there you can search the address for clues, which allows players to look around the crime scene (VR compatible also) and pick out clues; for example, the body might still be present along with a weapon or food, mobile devices or pets. As you’re looking around, you’re also searching the evidence deck for the clue cards that match what you have seen during the search. 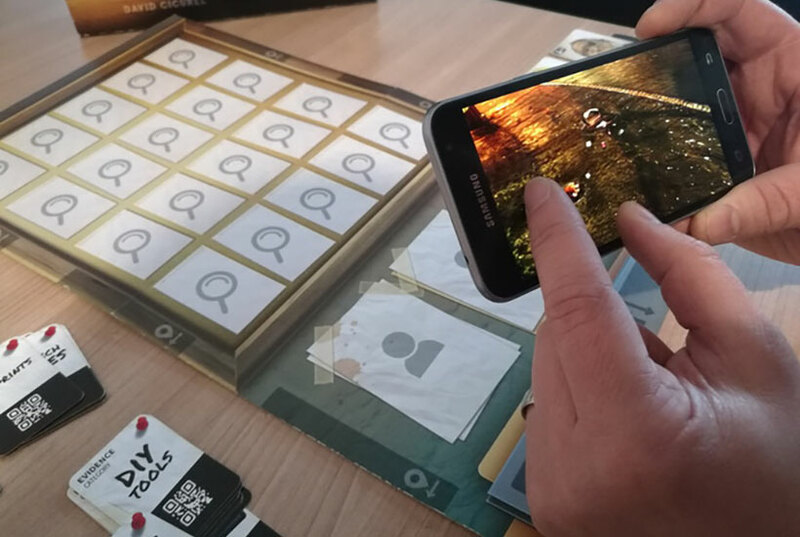 When players have finished searching, it is time to start scanning the QR codes on the clue cards which, if relevant, will give you a little more information about the deceased or the events surrounding their death. These clues are placed on the evidence board in an order that best suits the players. Now that you have searched the crime scene, you may wish to speak with witnesses at that location, and to do this you simply scan the QR code on their character card, which allows you to interact with them, hopefully finding out more information, unlocking a different location or giving names of people that you may wish to speak to. 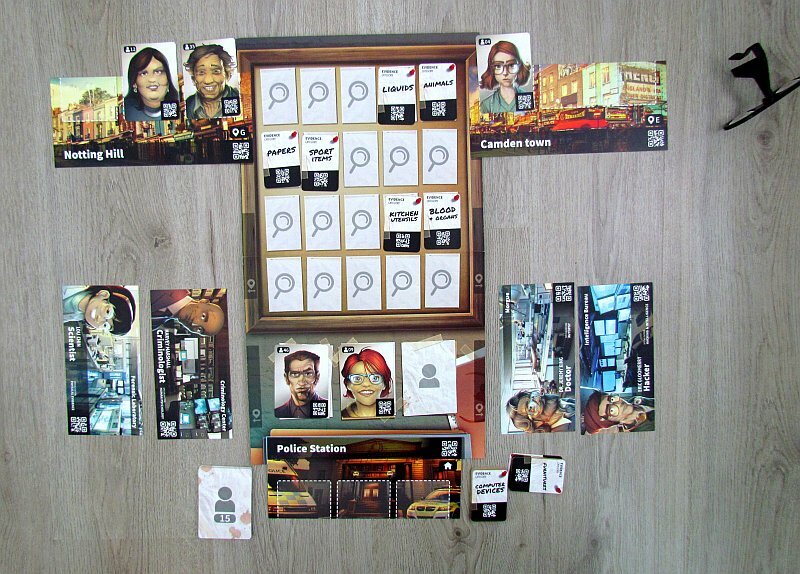 The game progresses as players move from location to location, questioning characters or finding clues until they’re able to solve the case, which players are able to do by returning to Scotland Yard and answering the Chief’s questions. The game has a built-in timer also, meaning every time you move to a new location, it adds 20 minutes into the day, with 5 minutes added on for every character that you speak to. This means that if you don’t solve the crime fast enough, then you may not solve it at all, or even worse, more people could die along the way. In order to help players solve the crime, they are given four forensic experts whom they can call throughout the game: a scientist who can examine physical evidence, such as a weapon, fingerprints or piece of clothing, a doctor who performs autopsies, a hacker who can examine mobile devices and computers to provide you with clues, like who the deceased’s last phone call was made to or what files are on their laptop, and a criminologist who will give you a profile on a particular character, whether that be a victim, witness or suspect. Players can interact with these characters at any time, but the clock will be progressed each time you do. The benefit of consulting those characters, however, can be massive. For example, having the scientist examine a weapon could unlock a special item card, such as a finger print or DNA, which can be further checked to unveil a potential suspect’s identity, or once the doctor has carried out his autopsy, the cause and time of death may be revealed, which may eliminate one character whilst pointing the finger at another. It will be up to the players to decide which clues are worth using precious time to investigate in order to solve the case. A few points about Chronicles before my summary: I will start with what I liked least about the game, which would mostly be the components. 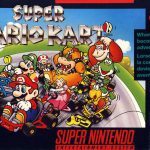 In general they are bland and lack flavour, which in this style of game isn’t such a big deal, but it’s something that’s definitely worth noting. The second thing is so basic that I can’t believe it’s even a thing. The app is fantastic, and I will talk about it more shortly, but the stories are littered with spelling mistakes, which along with the bland components, make the game seem unfinished and rushed; there are also a lot of “Americanisms” in the game, considering it is meant to be set in London. Moving away from the negative and back to the app, which is so easy to use; not at any point did we have an issue scanning the QR codes or being told to look for a card in error or the wrong order, it felt smooth and allowed the game to flow effortlessly. The ‘searching for clues’ aspect is also a very cool idea: Players will literally be put in the middle of the crime scene and rotate their phone 360 degrees in order to search for clues, and this is probably also why the age range of the game is 12+ years as despite the content being cartoon-like, you will still see dead bodies with various injuries. By allowing the app to teach players the game, it cuts out a lot of pre-reading, meaning players can literally open the box and get sucked in immediately. The game is surprisingly light as well. Don’t get me wrong, the harder scenarios are hard and will require a lot of thought and maybe a bit of luck in order to solve every aspect of a crime, but Chronicles never made me feel like a scenario couldn’t be done or drove me to lose patience or interest. The game comes with three separate cases, which can be saved in between play sessions. Whether you would want to replay a case once complete, I would highly doubt, meaning replay value will be quite limited. However, what David Cicurel and Lucky Duck have managed to do is create a system that can now be used for any theme: There is already a Noir expansion with at least one other planned, but just by simply adding a few extra cards, they could easily skin this with an ancient Egyptian theme or Spanish Inquisition and so on, similar to a game such as T.I.M.E. Stories. For more games like Chronicles of Crime, visit Asmodee or find your nearest games store. Wow, what a game. It’s fair to say that I had some pretty high expectations for Chronicles of Crime, and it has delivered all ends up. I was surprised that such a meaty ‘who done it’ game could be fit into such a lightweight and fast-paced experience that is also challenging and potentially rewarding. 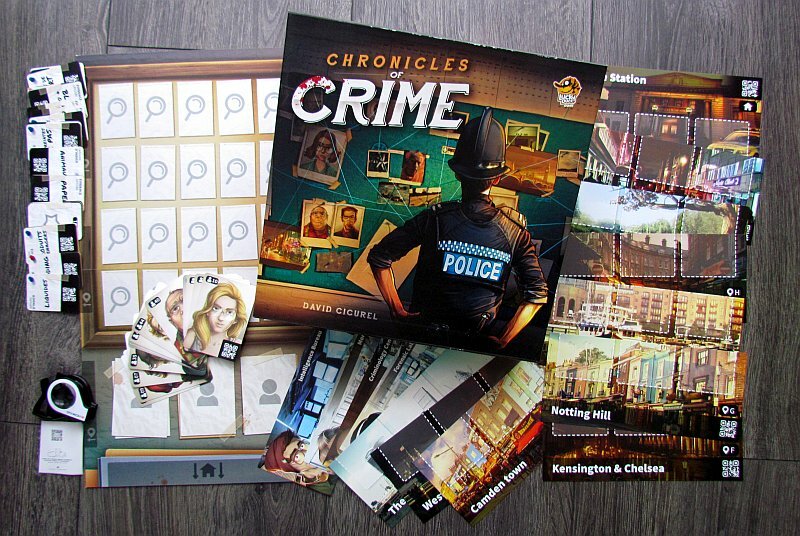 Chronicles of Crime is certainly a game in which I am already looking forward to playing future content and excited to see what directions Lucky Duck can go in. I have enjoyed playing this game immensely, and it's already my favourite new game that I have played this year.